This online-only article is a supplement to the September/October 2012 print edition of Home Energy Magazine. Educational display for homeowner—steps to a high-performance home. For the past 11 years, as a volunteer-driven nonprofit organization, NESP-Green Alliance has encouraged energy efficiency and resource preservation, and this year, EPA honored the organization with its 2011 Leadership in Housing Award for ENERGY STAR. Part of its mission has been to recognize and promote the companies, organizations, and individuals that support these efforts. NESP-Green Alliance also organizes informational meetings, seminars, and special events that promote community awareness, education, and connectivity for developing a more-sustainable Nevada. 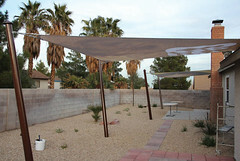 The collaborative demonstration project cited above consists of extensive upgrades to two Las Vegas homes. (For details on the upgrades, see “Deep Energy Retrofit Training—Sierra Hills Residence” and “Deep Energy Retrofit Training—Carmen Boulevard Residence.”) The Sierra, in the northwest Las Vegas Valley, is targeted to achieve 30% energy savings. The Carmen, about half a mile away, is targeted for a 50% reduction in energy use. Both homes are part of the City of Las Vegas Neighborhood Stabilization program; the goal of this program is to maintain neighborhood quality in the face of the area’s unfortunate status as the epicenter of the national foreclosure crisis. Completed in mid-February of 2012, the two homes provide a laboratory for construction and rehabilitation techniques. They demonstrate to Las Vegas homeowners—and, eventually, to homeowners nationwide—the real-world, bottom-line benefits of energy and water efficiency upgrades, especially for people on a limited income. effective ways to make their own homes more comfortable, safe, durable, and energy efficient. A key component of the demonstration project at all levels is collaboration among diverse organizations and government agencies. Partners include DOE’s Building America Retrofit Alliance (BARA) and the Consortium for Advanced Residential Buildings (CARB), which is documenting the efficiency upgrades. Locally, NESP–Green Alliance is joined by Better Building Performance, the City of Las Vegas, HomeFree Nevada, Green Chips, the Southern Nevada Water Authority, NV Energy, Southwest Gas, and several building contractors. This project demonstrates the true essence of an alliance. By working with our collaborative partners, nationally and locally, we can have a much greater impact on improving residential energy efficiency than we could if each organization set out to do it alone. That may be our greatest contribution to the national conversation about ways to achieve real energy efficiency. The demonstration project is, in many ways, a soup-to-nuts operation, which explains why there are so many partners. It took the national agencies and nonprofit groups, including DOE’s Building America program, to help get the project off the ground. Manufacturers have donated the materials for the renovation, while students—many of them contractors’ employees—have donated their labor, as part of the educational program described below. CARB, managed by Steven Winter Associates, internationally recognized experts on energy efficiency in new and existing buildings of all kinds, is providing the engineering and design for the upgrades. 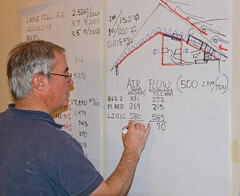 Richard “Rick” Chitwood, a California-based expert on residential building performance, has been essential in training local builders and contractors to implement the upgrades in the demonstration project. Founder of Chitwood Energy Management, Incorporated, Chitwood is chairman of the California Building Performance Contractors Association Technical Committee and has written for numerous publications on energy efficiency issues. The willingness of the contractors and their employees to learn from others is moving the dial past the status quo. Students in most training programs typically experience a 90-day lag between taking the training and using that training in the field. 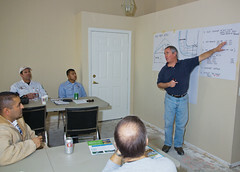 One measure of the success of our training program is that the contractors have been able to put their employees into the field almost immediately, incorporating classroom skills with hands-on application to the model homes. 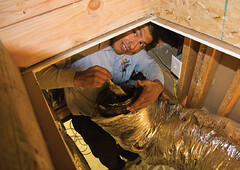 Kephart, who has overseen the weatherization of more than 3,000 homes in Las Vegas, predicts that the modeling software used on the demonstration homes will help them achieve the efficiency targets of 30% and 50% reduction in energy use. “We’re confident that these homes will exceed the projections through the combination of excellent modeling and field experience,” Kephart says. The contractor who understands building science can recognize structural opportunities in the actual home that don’t fit into the checklist of the software, and that’s a gap that the industry is working to fill. The framing on this home had many wall cavities that were open to the vented attic, turning what should be interior patrician walls into exterior surfaces. 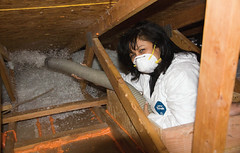 The ceiling insulation on this home was kraft-faced fiberglass batts that were installed with inset stapling. 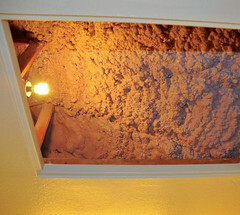 This installation technique creates a live air space between the ceiling drywall and the insulation. 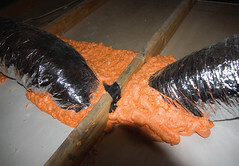 This convective airflow cavity can reduce insulation performance by 80%. This home has large attic knee walls. The problem described under point 2 above is even more significant on these vertical surfaces. In addition, attic knee walls are often not included at all in the energy model. The HVAC supply grille delivery velocity in this home is very low. Low delivery velocity creates temperature stratification in both summer and winter. This means that the system must run much longer to provide comfort in the occupied part of the room. The high sidewall supply grilles in this home deliver hot air at a low velocity. This hot air stays high in the room and does little to make us (and our cold feet) comfortable. The correction of hard-to-model items found during the retrofit are likely to improve this home’s performance by 60–80%. The instructor’s field experience led to a system redesign that simplified the mechanical system. Field experience teaches us repeatedly that installing a system well is hard—very hard. To make a mechanical AC system as easy as possible to install, the system must be as simple as possible. Keeping it simple not only improves the odds of a satisfactory installation but also reduces maintenance costs. 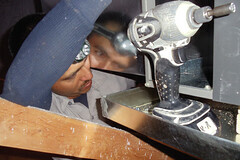 changing the duct design to a radial design, with each supply duct running back to the supply plenum. There was 1 inch of foam under the exterior stucco. This made the wall’s actual thermal performance much better than the modeled performance. The U-value used in the system design was 0.47, but the new windows will have a U-value of 0.29. The door to the master bedroom is a 5-foot double-door set. The kitchen/dining knee-wall location on the mechanical system sketch was misdrawn; it shows the kitchen area as being larger than it actually is. This additional information made it possible to further simplify the heating-and-cooling system. The return in the master bedroom was eliminated, since the 5-foot bedroom door undercut will allow a large-enough return air path. The supply grille in the kitchen was eliminated, since the kitchen supply grille and the dining room supply grille would have only been 6 feet apart. The final performance testing showed that both of these field redesigns were successful, since the pressure across the closed master bedroom doors was only 0.9 Pa, and there was no temperature difference between the kitchen and the dining room. The performance of the envelope was tested with a blower door and an infrared camera. The home’s infiltration rate is currently at 4.5 ACH50, but it will come down to around 3 ACH50 when all the retrofit measures are finished. Wall thermal performance is enhanced by having 1 inch of foam under the original stucco, which was installed 28 years ago. The home is ventilated with an energy recovery ventilator. Spot exhaust ventilation is provided in both bathrooms, with a 20-minute off delay. 870 CFM of delivered airflow (0.16 watt per CFM). The measured net delivered Btu matched the manufacturer’s performance data. The system uses only 1,610 watts (a little more than a hair dryer uses) to heat and cool this 1,521 ft2 home. Duct leakage to the outside is zero. Total duct leakage is 23 CFM25. After the demonstration project is completed, the contributions of HomeFree Nevada, a local 501(c)3 nonprofit, will be critical to the success of Nevada’s Home Performance with ENERGY STAR program. With support from local municipalities and the state’s Office of Energy, Nevada residents can qualify for rebates and financing to help offset the cost of improvements to their homes. To qualify for this financing, improvements must lower the homeowner’s energy costs at least 20%. HomeFree Nevada is the statewide sponsor for Home Performance with ENERGY STAR (HPwES), a national program jointly sponsored by EPA and DOE. As the statewide sponsor of HPwES, HomeFree Nevada takes a comprehensive whole-house approach that provides training for contractors and that reaches out to homeowners with awareness and education campaigns, and incentives and financing for efficiency upgrades. Denee Evans, HomeFree Nevada executive director, says that the collaboration with NESP-Green Alliance will help to educate the community about the benefits of making homes more comfortable and more cost-effective. “HomeFree Nevada will point to these pilot projects as hands-on examples of what individual homeowners can do to improve the quality of life in their homes and save money in the process” says Evans. Ultimately, the success of Nevada ENERGY STAR Partners will be determined not by the energy saved in the Carmen and the Sierra but by the number of homeowners who upgrade their own houses. Increasing the demand for upgrades through public education will help promote the success of the program as well as providing ways for homeowners to afford the work. Fortunately, one of the other partners in the collaboration has helped to create a low-interest loan program for home performance upgrades. Green Chips, a nonprofit agency created through a public-private partnership, has designed a program of loans of up to $7,500 with rates as low as 2.4%, offered through the local Nevada State Bank. The loans, combined with tax credits, provide financing for owners whose homes are projected to achieve a 20% energy efficiency improvement through the initial modeling. It’s a signature loan; no equity is required. The homeowner’s savings on the utility bill are redirected to the payment of the loan, making this a win-win solution. Green Chips has received support from some of the biggest employers in the Las Vegas Valley; major supporters include the City of Las Vegas, Harrah’s, and MGM Resorts. Through these employers’ internal communication channels and via an online portal, Green Chips plans to reach thousands of residents with the sustainability message and inform them of the financial options for creating a more energy-efficient home. Many energy features are difficult to model accurately, since modelers are often required to estimate the performance of specific energy features. In this home, a very easy envelope improvement was not modeled—moving the pressure boundary to the bottom truss cord above the bathroom and hall. 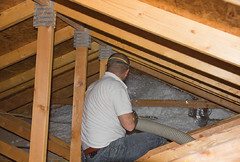 This simple change brings both the attic knee walls and the ducts inside. On this project, and typically on most projects, the system design changed only because certain HVAC equipment was unavailable. The project started out with a ductless mini-split heat pump system with four terminal units. A mini-split was not available, so the design was changed to a split-system heat pump with four supply grilles and ducts in the attic, and a condensing unit on the north side of the house, outside the kitchen. 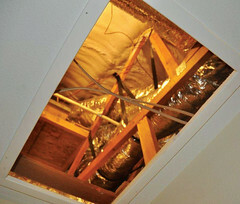 There was no attic space above the bedroom 2 closet, where the supply and return ducts were to be located. There was not enough space for the condensing unit outside the kitchen. The pressure boundary could be easily relocated to the bottom cord of the scissor trusses. This relocation simplifies the ceiling insulation installation, brings the attic knee walls inside the thermal and pressure boundaries, and creates a space for the ducts to be located inside the thermal and pressure boundaries. This additional information made it possible to improve and simplify the heating-and-cooling system. The air handler was moved from the bedroom 2 closet to the hall closet. The condensing unit was put on the roof, where the old package unit had been located. Eliminating the supply grille in the kitchen reduced the number of supply grilles from four to three. Eliminating the kitchen supply grille was possible for two reasons. The kitchen is very open to the living room. The thermal envelope is better—that is, thermal loads are smaller—than we originally thought. This is because there is foam under the stucco, because window performance is better than expected, and because we relocated the envelope to the bottom truss cord above the hall bath and the hall. This eliminated the attic knee walls and created space for the ducts to be inside. The final performance testing showed that the field redesign was successful, since there was no temperature difference between the kitchen and the living room. The performance of the envelope was tested with a blower door and an infrared camera. Two infrared videos, with natural pressures and depressurized, were made. The home’s infiltration rate is currently at 4 ACH50, but it will be down around 3 ACH50 when all the retrofit measures (windows, doors, and tub surrounds) are finished. Wall thermal performance was enhanced by having 1 inch of foam under the original stucco, which was installed 24 years ago. Simple system: three supply grilles, no return air system. MERV 16 filtration (HEPA), 4 inch pleated, is installed in the air handler filter slot. System fan energy is only 185 watts for 1,000 CFM of delivered airflow (0.18 watt per CFM). System static pressure is 0.13 inch water column, without the supply grilles installed. The final static will be about 0.24 inch water column after the grilles are installed, or about one-third of the typical 0.81 inches WC. 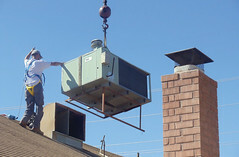 A 3-ton air conditioner was replaced with a new 2-ton air conditioner. The measured net delivered Btu exceeded the manufacturer’s performance data by 4%. The system uses only 1,535 watts (or a little more than a hair dryer uses) to heat and cool this 1,130 ft2 home. Duct leakage to the outside is zero. Total duct leakage is 17 CFM25. Another goal of the collaborative demonstration project is to make homeowners aware of the energy savings they may be missing out on in their own homes. 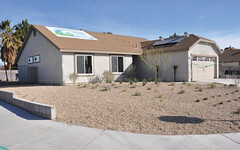 NESP-Green Alliance will reach out to southern Nevada homeowners in 2012, and the demonstration homes will be open for public viewing through May. The model homes themselves will serve as centers for disseminating information on utility rebates, loans, state rebates, tax credits, and other opportunities to help homeowners and contractors make efficiency upgrades. Homeowners want to improve their homes’ performance. What we are doing is helping them to discover the methods introducing the many financial tools that are available, and lining them up with qualified contractors. Ultimately they will be successful in reducing their energy consumption, and they too will become part of the big-picture solution to our nation’s energy crisis. To learn more about Nevada ENERGY STAR Partners–Green Alliance, go to www.Thinkenergystar.com. Building America Retrofit Alliance Efficient Energy Remodeling web site: www.barateam.org/eer. Annette Bubak is president and cofounder of Nevada ENERGY STAR Partners–Green Alliance and vice president of Better Building Performance. 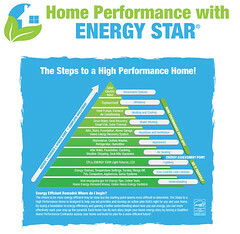 Home Performance with Energy Star is ten years old. What can its past teach us for our future?